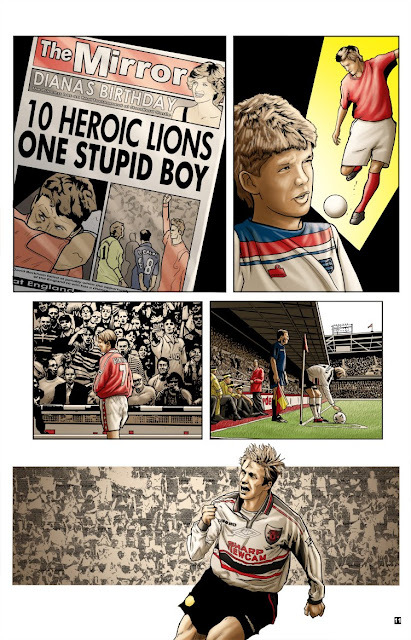 I've recently been lucky enough to have been given the colouring work the the David Beckham book for Bluewater productions Fame series. Similarly to all the colouring jobs I'm offered I view this as a great and very enjoyable opportunity. I've decided to spend some time here to give everyone an inside view of the colouring process that will help bring this book to life. I start with the line art and script provided by Bluewater. Before I start colouring I adjust the contrast and clean up the line art. Pablo Martinena's art is so clean it makes this part really easy. I then choose an overall tone, this will help to tie all the colours together later on. I then start to lay down the flat colours starting with the largest area of a single colour. This really helps with the rest of the page. At this point I reference everything, I am very lucky as Peter Rogers script has included all the reference for me. And then the rest of the flat colours. I then re-apply the overall tone. I then start adding the details, the highlights and the shadows using separate layers. I then render the rest. After this I add any highlights speedlines and other lighting effects required to make the piece pop. And here's the finished piece... GOAL!!! Following this here are a couple more pages coloured for this book. I hope everyone has enjoyed this inside look.